Jeff assessing the suitability of family dog Daisy as a potential piano bench. Kauffman family lore has it that a two year old Jeff heard Johnny Mathis warbling “Small World” (from Gypsy) on the radio one day, and then toddled over to the family piano and began plunking it out flawlessly with one finger. That soon led to years of piano lessons from a variety of teachers in both Salt Lake City and Seattle. 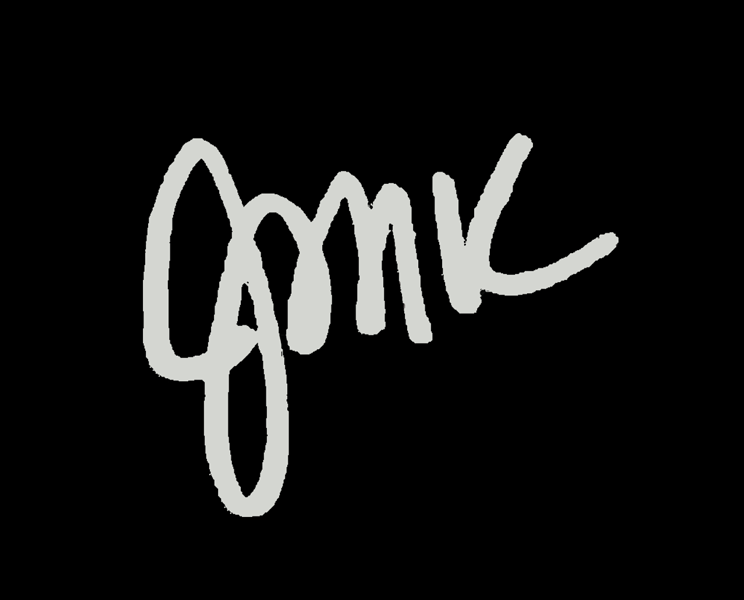 Jeff began gigging regularly when he was still a teenager in Salt Lake City (including in a trio which featured an electric violin and a Radio Shack synthesizer–with patch cords). While a student at the University of Utah, he became friends with the late professor Bruce Reich, who encouraged Jeff’s compositional efforts, which ultimately led to a number of classically oriented pieces, including a setting of T.S. Eliot’s Four Quartets for mezzo and chamber ensemble, and the background score for playwright David Kranes’ Fugue, for string quartet and acoustic guitar. Moving to Portland immediately after graduating from college, Jeff quickly established himself as both a solo pianist and member of various bands. He founded a world music jazz-pop-rock group named Qabala Deluxe, and he later refined his concept for a number of recordings he gathered under the name Aqabala, one of which won Jazziz Magazine’s Vocal Jazz competition. Jeff is a writer and publisher member of ASCAP. All of Jeff’s original material is copyrighted and is administered and published by Ba’alshazar Music. 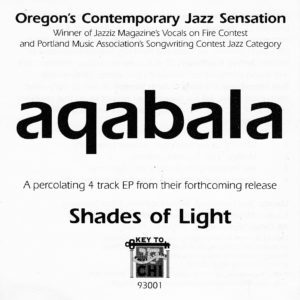 Jeff’s award-winning group Aqabala has received international attention for its blend of world, jazz, classical and pop idioms. His solo piano playing has been heard and acclaimed by thousands. Jeff supplied the original score for the pilot of the ambitious CBS broadcast Pillars of Portland. This pilot was envisioned as the launching pad for the first locally produced daily soap opera. Jeff was therefore commissioned to not only compose a score for the pilot itself, including themes intended for re-use for the proposed daily show and scene specific cues, but also to develop a library of character motifs and bumpers that could be used in future broadcasts. Pillars ultimately aired in a drastically edited version as a two-hour television movie, using some of Jeff’s source music, as well as contributions by such artists as Quarterflash and Craig Carothers. 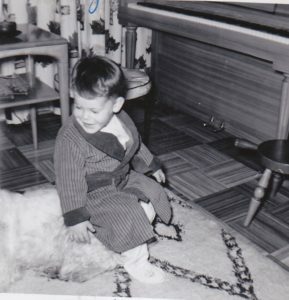 Jeff also wrote the solo piano score for the children’s ballet Alice in Wonderland, which garnered Portland’s first ever CableACE nomination for Outstanding Production. Jeff has been fortunate to have several of his original musicals produced in fully staged presentations, as well as others done in readings. Z’vi is a through sung piece based on the 17th century Messianic heresy of Sabbatai Z’vi. 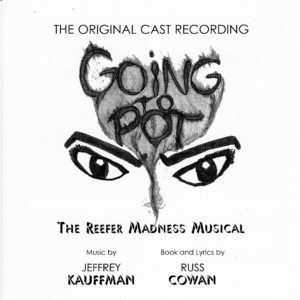 Jeff’s adaptation of the cult propaganda film Reefer Madness has received uniform raves for its “tuneful and witty”*** pastiche score,which relies heavily on the Latin rhythms that were considered so “dangerous” in the 1930s, the setting of the musical. Jeff’s nationally commissioned work for the Resident Artists of Portland Opera contains some of his most challenging vocal music, including tour-de-force soprano arias for a trio of Portland’s most gifted opera singers. 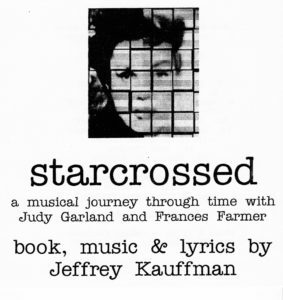 Starcrossed is a pet project of Jeff’s, based upon a real life 1967 meeting between legendary actresses Judy Garland and Frances Farmer in Indianapolis. Jeff is also asked to write specialty material for many artists. Belle/Rachel (performed by Pamela Mahon and Elizabeth Lower) Belle is a street person known as “Scream.” Rachel is a nun returning from India. Their paths will soon cross. Laurel/Rudyard (performed by Teresa Koon and Shawn Rogers) Laurel is a hermitess visionary. Rudyard is Belle/Scream’s father, a world traveller who has lost track of his daughter. Who Do You Think You’re Kidding? (performed by Stacy Tilbury and Johnny Hamilton) The war of the sexes, 30s style. Minds and Bodies (performed by Joseph Butler) The Coach reveals his strategy. You Got Jack (performed by James Lawrence) Jack is his own best friend. Getaway Song (performed by Debra Lund and James Lawrence) Mae and Jack make plans. Just Look at You Now (performed by Adair Chappell and Susannah Mars) Judy and Frances meet each other backstage after Judy’s concert. Rainbow Morning (performed by Adair Chappell and Susannah Mars) The masks begin to crumble as memories intrude. Little Sister (performed by Chrisse Roccaro) Lillian Farmer sings to her daughter Frances. Papa (performed by Susannah Mars) Frances yearns for her often absent father. Lullaby (performed by Adair Chappell and Susannah Mars) The women mourn their aborted children. On the Edge (performed by Adair Chappell and Susannah Mars) Act One finale. Judy’s Solution (performed by Adair Chappell) Judy has the answer to her problems.